A Today, there are over seven billion people living on Earth. No other species has exerted as much influence over the planet as us. But turn the clock back 80,000 years and we were one of a number of species roaming the Earth. Our own species. Homo sapiens (Latin for ’wise man'), was most successful in Africa. In western Eurasia, the Neanderthals dominated, while Homo erectus may have lived in Indonesia. Meanwhile, an unusual finger bone and tooth, discovered in Denisova cave in Siberia in 2008, have led scientists to believe that yet another human population - the Denisovans - may also have been widespread across Asia. Somewhere along the line, these other human species died out, leaving Homo sapiens as the sole survivor. So what made us the winners in the battle for survival? C Some 45.000 years later, another fight for survival took place. 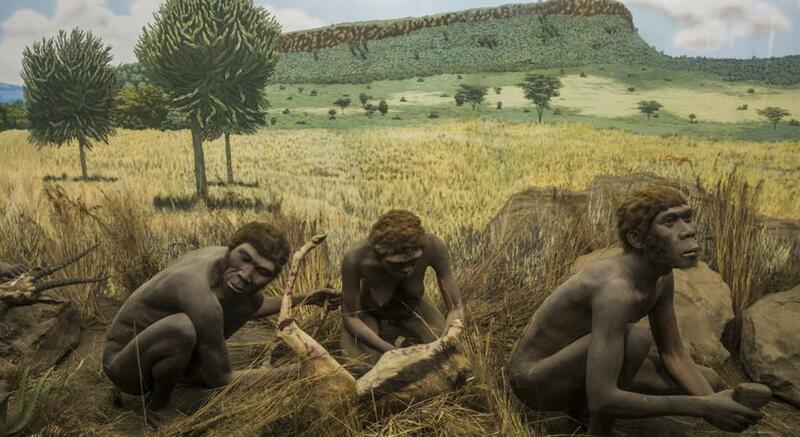 This time, the location was Europe and the protagonists were another species, the Neanderthals. They were a highly successful species that dominated the European landscape for 300.000 years. Yet within just a few thousand years of the arrival of Homo sapiens, their numbers plummeted. They eventually disappeared from the landscape around 30.000 years ago with their last known refuge being southern Iberia, including Gibraltar. Initially. Homo sapiens and Neanderthals lived alongside each other and had no reason to compete. But then Europe’s climate swung into a cold, inhospitable, dry phase. ‘Neanderthal and Homo sapiens populations had to retreat to refugia (pockets of habitable land). This heightened competition between the two groups,’ explains Chris Stringer, anthropologist at the Natural History Museum in London. D Both species were strong and stockier than the average human today, but Neanderthals were particularly robust. ‘Their skeletons show that they had broad shoulders and thick necks,' says Stringer. ‘Homo sapiens, on the other hand, had longer forearms, which undoubtedly enabled them to throw a spear from some distance, with less danger and using relatively little energy,’ explains Stringer. This long-range ability may have given Homo sapiens an advantage in hunting. When it came to keeping warm. Homo sapiens had another skill: weaving and sewing. Archaeologists have uncovered simple needles fashioned from ivory and bone alongside Homo sapiens, dating as far back as 35,000 years ago. ‘Using this technology, we could use animal skins to make ourselves tents, warm clothes and fur boots,’ says Stringer. In contrast. Neanderthals never seemed to master sewing skills, instead relying on pinning skins together with thorns. E A thirst for exploration provided Homo sapiens with another significant advantage over Neanderthals. Objects such as shell beads and flint tools, discovered many miles from their source, show that our ancestors travelled over large distances, in order to barter and exchange useful materials, and share ideas and knowledge. By contrast. Neanderthals tended to keep themselves to themselves, living in small groups. They misdirected their energies by only gathering resources from their immediate surroundings and perhaps failing to discover new technologies outside their territory. F Some of these differences in behaviour may have emerged because the two species thought in different ways. By comparing skull shapes, archaeologists have shown that Homo sapiens had a more developed temporal lobe - the regions at the side of the brain, associated with listening, language and long-term memory. 'We think that Homo sapiens had a significantly more complex language than Neanderthals and were able to comprehend and discuss concepts such as the distant past and future.' says Stringer. Penny Spikins, an archaeologist at the University of York, has recently suggested that Homo sapiens may also have had a greater diversity of brain types than Neanderthals. 6 Analysis of stone tools and has enabled Petraglia’s team to put forward an arrival date for Homo sapiens in eastern India. 7 Homo sapiens used both to make sewing implements. 9 Archaeologists examined in order to get an insight into Neanderthal and Homo sapiens' capacity for language and thought. 10 ABC No evidence can be found to suggest that Neanderthal communities allocated tasks to different members. 11 ABC Homo sapiens may have been able to plan ahead. 12 ABC Scientists cannot be sure whether a sudden natural disaster contributed to the loss of a human species. 13 ABC Environmental conditions restricted the areas where Homo sapiens and Neanderthals could live.